The 1800ES is a somewhat rare version of Volvo's 1800 model, only sold in 1972 & '73 model years as a way to extend the life of the long-in-the-tooth 1800 coupe. The funky looks can be polarizing - the Germans call this model Schneewittchensarg, which translates literally to "Snow White's coffin," but expect attention everywhere you go in one of these. 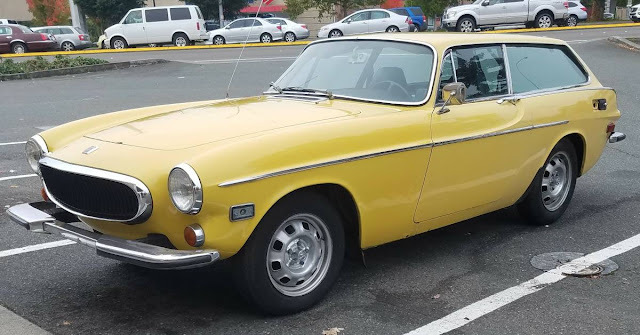 Find this 1973 Volvo 1800 ES offered for $5500 near Seattle, WA. Tip from Zach. 1973 Volvo 1800 ES, auto trans, runs and drives, good candidate for restoration project, weekend fun car or simply drive it while you fix it up. Typical rust in tailgate, rockers and passenger floor boards but all very repairable. Couple boxes of spare parts available. Too many projects and not enough time, do not need to sell, currently stored inside and can stay there till I have time to get back to it. Consider trade(s) for bobcat skidsteer or similiar, kubota style front end loader, Unimog (or similiar) or full size Ford truck (4x4 preferred). I have a rule about rust: whatever you can see is the tip of the iceberg. There's always more lurking underneath. That being said, all of these 1800s rust in those areas that this guy mentions. Even out here in old car heaven (So-Cal). It's a matter of if it's been fixed in the past, not whether it has rust...because they all do or did at one point. If you're looking at buying one that doesn't have visible rust in the rockers etc. then the question is: how well was it repaired? If you're looking at one that hasn't yet been repaired, and you can see the original metal with rust damage, then at least you have the opportunity to fix it right. That's my optimistic view anyway. Mine was a CA car and still needed repair of both rockers, both floors and batt box. Par for the course. No one here wanted to touch it under the hood, so I did it all myself. Which means they are ridiculously easy to wrench on, other than the FI. Granted its Craigslist, but a sketchly ad nonetheless for an 1800 ES. Does it have an OD? Did slushboxes come with OD? I'd like to have one of these. I almost talked a local out of his green one with an aftermarket metal sunroof!, 5 speed and OD some years back. Should have talked faster. More waves and smiles and window lean-out-and-shouts than any other car I’ve driven. Drove like a truck and felt twice again as heavy but damn if that roofline ain’t pretty. Vitesse Dépréciation: 1997 Range Rover 4.6 H.S.E. Is Z31 Better Than Zee Others? The DTM5 is on the Market! DT Calendar 2018, Submit Your Pics Now!